The National Union of Peoples’ Lawyers (NUPL), counsel for security guard Rolly Panesa who who was tagged by the military as a supposed top-ranking rebel leader, welcomed with sigh of relief the August 27, 2013 Decision of the Court of Appeals finally granting after several months the petition for the issuance of the privilege of the writ of habeas corpus. Even as it comes belatedly, we commend the Decision for finally seeing through all the deliberate lies and clumsy fabrications of the military to justify the violation of his rights. 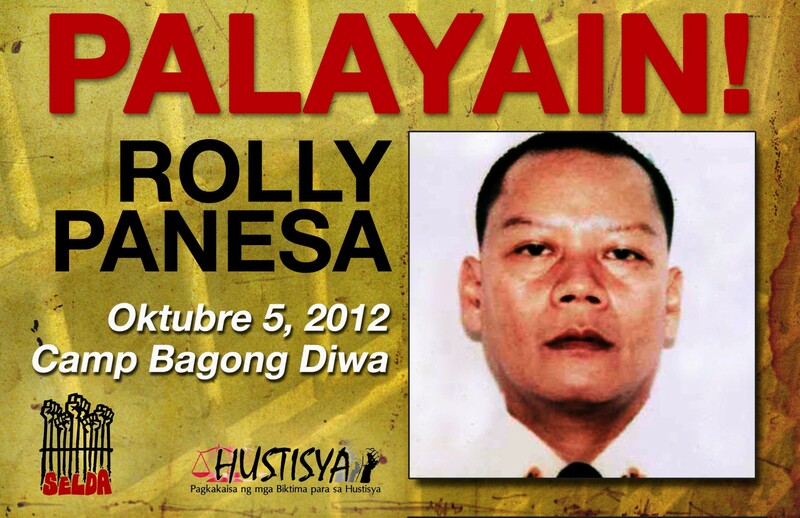 Rolly Panesa, an ordinary security guard for the longest time, was illegally arrested way back October 5, 2012 at a busy intersection in Quezon City and detained by joint elements of the 2nd Infantry Division of the Philippine Army, led by Southern Luzon Commander Maj. General Alan Luga, and the Philippine National Police. He was severely tortured while the military cynically misidentified him for a certain “Benjamin Mendoza,” supposedly the secretary of the Communist Party of the Philippines (CPP) in Southern Luzon, with a reward of PhP 5.6 million. At the same time, the NUPL laments the long drawn-out and tedious legal proceedings that Panesa had to undergo just to simply prove that he is not what the military says he was and despite overhelming evidence to establish his identity. This includes multiple official identification cards and records issued by government agencies themselves on top of incotrovertible testimonial evidence, in stark contrast to the self-serving, contrived and ludicrous accounts of spurious witnesses for the military a.k.a. roving rebel retrunees. It does not give comfort that the Office of the Solicitor General was, wittingly or unwittingly, a party all throughout to the perpetuation of this gross injustice. The NUPL pointed out that the poor fellow had to endure almost 11 months in detention while awating his deserved vindication. If there is any classic example of justice delayed and justice denied, this no doubt fits the bill. Nothing indeed will bring him back all those times lost and the damage wrought on his reputation, not to mention the agony and ordeal he and his family went through. The NUPL condemns the money-making scheme of the Department of National Defense-Department of Interior and Local Government’s secret hit list as it is now again proven to be dubious. 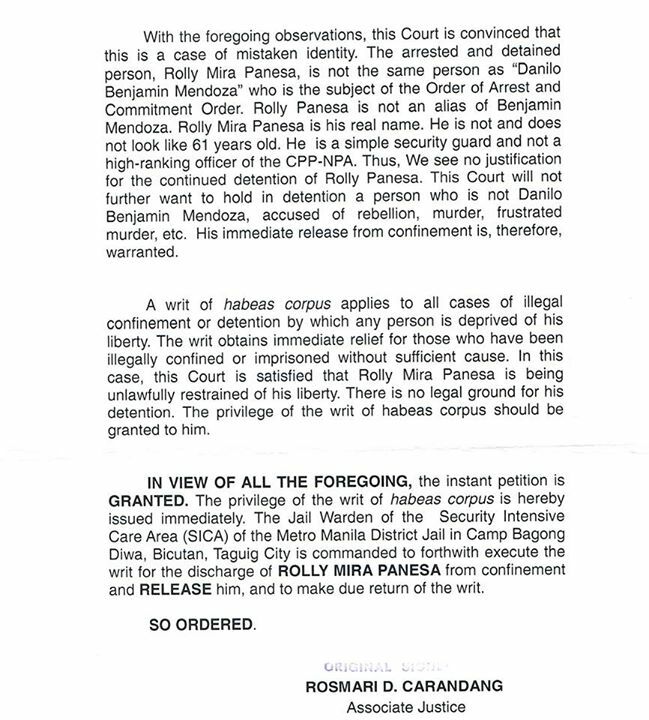 Previously, a certain Olegario Sebas of Negros Oriental who was similarly arrested for purportedly being another rebel leader was also ordered released by virtue of a habeas corpus petition. The payment by the AFP of handsome reward money to supposed informers for the capture of what it referred to as “terrorist personalities and communist leaders” is farcical, withal dangerous. Thus, the DND-DILG’s secret hit list must be scrapped totally and immediately as it has become the basis to arrest, detain, and torture people on false charges; or worse, disappeared or killed. In addition, those who concocted this not so bright idea should also be held accountable for misusing the people’s money to violate people rights. MANILA, Philippines – The relatives of a security guard arrested for reportedly being a ranking member of the Communist Party of the Philippines will troop to Court of Appeals in Manila for a hearing on the case, the rights group Karapatan said on Friday. Karapatan members will join the legal counsels from the National Union of People’s Lawyers and relatives of Rolly Panesa for the hearing of the writ of habeas corpus this afternoon at the CA building in Ma. Orosa St., Ermita, Manila. Respondents in the case are Insp. Bernardino Camus of Metro Manila District Jail warden, Maj. Gen. Alan Luga of the Southern Luzon Command, Maj. Gen. Eduardo Del Rosario of the 2nd Infantry Division, Chief Superintendent James Melad and Police Senior Superintendent Manuel Abu. Karapatan said Panesa, a security guard of the Megaforce Security, was arrested on Oct. 5, 2011 by police and military personnel. The group claimed that Panesa was mistaken for “Benjamin Mendoza”, whom the military alleged as a high-ranking official of the Communist Party of the Philippines with a bounty of P5.6 million. 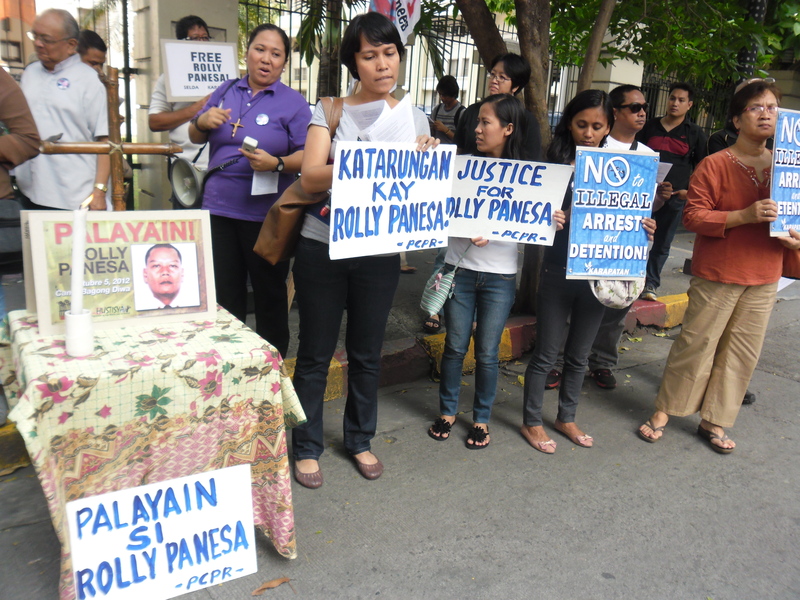 Free Rolly Panesa! Defend the Sanctity of Life! The Task Force Free Rolly Panesa composed of different religious and faith based group and individuals deplore the continuous illegal detention and violation of basic rights of Rolly Panesa and other political detainees under Aquino’s watch. These violations, despite serious protests from victims, families and various human rights advocates, continue to perpetuate under Oplan Bayanihan. Such violations disregard his dignity as a human being, as one created in the image of God. It will be remembered that on October 5, 2012, Rolly and 3 other members of his family including his wife were abducted by elements of 2nd Infantry Division, Philippine Army and Philippine National Police along Aurora Blvd. Cubao, Quezon City. They were handcuffed, blindfolded and interrogated. Rolly suffered torment and inhumane treatment at the hands of his military captors. To this day, they insist that he is Benjamin Mendoza, a high ranking communist leader who has a P5.6M bounty upon his capture. They are detaining an innocent man who must be released immediately. Based on the documents and testimonies presented by the Panesa family, Rolly, 48 years old, who hails from Cadiz City, Negros Occidental and working as a security guard since 1995 bore no semblance to Benjamin Mendoza except a mole at the nape of his neck. Under Aquino’s Oplan Bayanihan, the target to render communist’s insurgency irrelevant poses grave threat to the general public as more and more civilians are accounted victims. There are more than 300 political detainees, 137 victims of extra-judicial killings, and tens of thousands of forced evacuees among many other violations. On his third year in office, Aquino’s score on human rights unveils what he truly meant by “peace and development”. The Voice of God is Calling, Do You Hear His Cry? In the face of this threat to life and dignity, church people are called to speak out and defend the rights, to be a neighbour especially to the least and marginalized. One with conviction, we commit to the continuing aspirations of many other human rights and peace advocates – Free Rolly Panesa and other political detainees; Stop human rights violations! Rights group SELDA criticized the brazen impunity under the Aquino administration with the increasing number of political prisoners, continued filing of trumped up charges and the brute force inflicted upon so-called enemies of the state. “The Aquino government may deny the existence of political prisoners but it continues on a rampage with the successive arrest of political prisoners. A total of 123 prisoners of conscience have been arrested under Noynoy Aquino’s regime. Forty-four of them were arrested in this year alone,” said Angelina Ipong, SELDA secretary general. She added that the Aquino government has also denied the release of 14 consultants of the National Democratic Front of the Philippines, who are involved in the peace talks with the Philippine government. In a protest action in front of Camp Crame, SELDA, together with relatives of political prisoners made big “peace cranes,” an origami artwork of the bird symbolizing their demand for justice and freedom for all political prisoners. The human rights organization lambasted the foul schemes of the Armed Forces of the Philippines in identifying its target for arrest and detention. It highlighted the case of Rolly Panesa, a security guard who was mistaken for Benjamin Mendoza, an alleged high-ranking New People’s Army rebel. “By virtue of a mole at the back of Rolly’s neck, military soldiers insisted that they had caught a big fish. This is very dangerous for ordinary folks. A common distinguishing mark between you and a target could mean a drastic change in your life.” Ipong continued. Rolly Panesa, together with his common-law-wife, Marites Chioco, Marites’ daughter and son-in-law were only on their way home when they were suddenly dragged into waiting vehicles on the street by armed men on October 5, 2012. “Next thing he knew, Rollywas blindfolded, handcuffed and beaten black and blue for the next three days. Now he has the burden of proving that he is not the person his military captors earned P5.6M for.” Ipong protested. Trumped up charges have likewise continued to be employed in the arrest and detention of human rights defenders and community workers. “The filing of trumped up charges against political prisoners is a common practice of the state and it is used without let-up by the Aquino government to silence its critics, more so that the military is hungrily running after the hefty rewards of catching its targets.” Ipong declared. “Peace is not part of the Aquino government’s agenda, as it continues to deceive the Filipino people that it is sincere in finding a solution to their economic, social, cultural, civil and political problems. Instead of releasing political prisoners, Aquino is set on arresting and detaining more of its critics with this latest act. But we will continue with our campaign to free all political prisoners,” Ipong concluded.